This is our Service Agreement. The No Nonsense Fat Melting Secrets provides its services to you subject to the Terms and Conditions contained in this Service Agreement. If you visit or shop at The No Nonsense Fat Melting Secrets, you accept these Terms and Conditions. All content, products and services are not to be considered as legal or professional advice, and are to be used for personal entertainment purposes only. You use the knowledge provided at your own risk and we are not liable for any negative consequence as a result of following the advice given. Remember, each situation is different and if you feel that the methods in this method do not apply to you, then it is your responsibility to contact us within the 60 day period and seek a refund. We have a very generous money back guarantee to cater situations where our course cannot provide a solution for you. Testimonials have not been independently verified, and some are for demonstrative and illustrative purposes and they merely reflect the opinions and experiences of the creators of The No Nonsense Fat Melting Secrets's products or other products within our product range, and are submitted to The No Nonsense Fat Melting Secrets voluntarily by customers, ourselves or obtained through compensation. If you would like to submit a testimonial to The No Nonsense Fat Melting Secrets. You agree that it becomes the exclusive property of The No Nonsense Fat Melting Secrets, which for example includes the rights to reproduce, edit (for length but not general content), and/or publish the testimonial, which may include your name or initials and city/state/country of residence. Some customers that have submitted testimonials may have received a The No Nonsense Fat Melting Secrets product or service as a "thank you" in appreciation for the time they invested to write or record their testimonials. Thank you! If you are not 100% satisfied with your purchase, We will be happy to accept a return within the specified time period for a full refund, within 60 days of your purchase. If you do not agree to be bound by all of these Terms and Conditions, please do not use or access this Website. The contents of this Website, including the text, graphics, images, and information obtained from The No Nonsense Fat Melting Secrets third-party content providers, sponsors, suppliers, and licensors (collectively "Providers"), and any other materials are to be used for informational purposes only. When you visit the Website or fill out any online forms, you are communicating with us electronically. You consent to receive communications (including legal notices) from us electronically. We will communicate with you by email, phone, text messages, mail or by posting notices on the Website. You agree that all agreements, notices, disclosures and other communications that we provide to you electronically satisfy any legal requirement that such communications be in writing. The No Nonsense Fat Melting Secrets may also deliver communications to you electronically. In addition, The No Nonsense Fat Melting Secrets may deliver communications (including legal notices) to you at the street address you provided. Finally, The No Nonsense Fat Melting Secrets may deliver communications to you by any means set forth in any other The No Nonsense Fat Melting Secrets policy or notice published on the Website. The No Nonsense Fat Melting Secrets grants you a limited license to access and make personal use of the Website and you may not download (other than page caching) or modify it, or any portion of it, without the express written consent of The No Nonsense Fat Melting Secrets . This license does not include any resale or commercial use of the Website or its contents; any collection and use of any product listings, descriptions, or prices; any derivative use of the Website or its contents; or any use of data mining, robots, or similar data gathering and extraction tools. The Website or any portion thereof may not be reproduced, duplicated, copied, sold, resold, or otherwise exploited for any commercial purpose without express written consent of The No Nonsense Fat Melting Secrets . You may not frame or utilize any framing techniques to enclose any trademark, logo, or other proprietary information (including images, text, page layout, or form) of The No Nonsense Fat Melting Secrets without our express written consent. You may not use any metatags or any other hidden text utilizing The No Nonsense Fat Melting Secrets name or trademarks without the express written consent of The No Nonsense Fat Melting Secrets . Any unauthorized use terminates the permission or license granted by The No Nonsense Fat Melting Secrets . You are granted a limited, revocable, and nonexclusive right to create a hyperlink to the home page of the Website so long as the link does not portray The No Nonsense Fat Melting Secrets , its affiliates, or their products or services in a false, misleading, derogatory, or otherwise offensive manner. 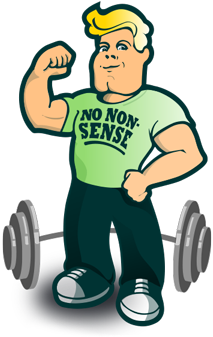 You may not use any The No Nonsense Fat Melting Secrets logo or other proprietary graphic or trademark as part of the link without express written permission. Users of the Website (individually and collectively, "User") expressly agree that use of the Website is at User's sole risk. Neither The No Nonsense Fat Melting Secrets , nor its employees or Providers, warrant that the Website will be uninterrupted or error-free; nor do they warrant or make any representation regarding the use of the information provided on the Website or the results that may be obtained from the use of the information provided on the Website, or as to the accuracy, reliability, or currency of any information, content, service, or merchandise provided through the Website. The No Nonsense Fat Melting Secrets MAKES NO REPRESENTATIONS OR WARRANTIES OF ANY KIND, EXPRESS OR IMPLIED, AS TO THE OPERATION OF THE WEBSITE OR THE INFORMATION, CONTENT, MATERIALS, PRODUCTS OR INDIVIDUALS INCLUDED OR LISTED ON THE WEBSITE. TO THE FULLEST EXTENT PERMISSIBLE BY APPLICABLE LAW, The No Nonsense Fat Melting Secrets DISCLAIMS ALL WARRANTIES, EXPRESS OR IMPLIED, INCLUDING BUT NOT LIMITED TO, IMPLIED WARRANTIES OF MERCHANTABILITY AND FITNESS FOR A PARTICULAR PURPOSE. UNDER NO CIRCUMSTANCES SHALL The No Nonsense Fat Melting Secrets OR PROVIDERS BE LIABLE TO YOU OR ANY THIRD-PARTY FOR ANY INDIRECT, CONSEQUENTIAL, INCIDENTAL, SPECIAL OR PUNITIVE DAMAGES, INCLUDING, BUT NOT LIMITED TO, LOST PROFITS AND BUSINESS INTERRUPTION, WHETHER IN CONTRACT OR IN TORT, INCLUDING NEGLIGENCE, ARISING IN ANY WAY FROM ANY PRODUCT OR SERVICE SOLD, RECOMMENDED OR PROVIDED ON THE WEBSITE OR THE USE OF THE INFORMATION OR THE RESULTS OF THE USE OF THE INFORMATION PROVIDED ON THE WEBSITE, EVEN IF The No Nonsense Fat Melting Secrets IS EXPRESSLY ADVISED OF THE POSSIBILITY OF SUCH DAMAGES. IN NO EVENT SHALL The No Nonsense Fat Melting Secrets's LIABILITY EXCEED THE PRICE YOU PAID FOR A PRODUCT OR SERVICE THAT IS THE SUBJECT OF THE CLAIM. NO ORAL ADVICE OR WRITTEN INFORMATION GIVEN BY The No Nonsense Fat Melting Secrets , PROVIDERS OR THE LIKE, SHALL CREATE A WARRANTY; NOR SHALL USER RELY ON ANY SUCH INFORMATION OR ADVICE. Under no circumstances shall The No Nonsense Fat Melting Secrets or any other party involved in creating, producing, or distributing the Website be liable for any direct, indirect, incidental, special, or consequential damages that result from the use of or inability to use the Website, including but not limited to the results from mistakes, omissions, interruptions, deletion of files or email, errors, defects, viruses, delays in operation or transmission, or any failure of performance, whether or not resulting from acts of God, communications failure, theft, destruction, or unauthorized access to the Website's records, programs, or services. User acknowledges that this paragraph shall apply to all content, merchandise, and services available through the Website. In those states that do not allow the exclusion or limitation of liability for consequential or incidental damages, liability is limited to the fullest extent permitted by law. The Website contains information, data, software, photographs, graphs, videos, typefaces, graphics, audio and other material (collectively "Content"). Regarding the Content supplied by Users or parties other than The No Nonsense Fat Melting Secrets, The No Nonsense Fat Melting Secrets is a product information website and not a publisher or distributor. The No Nonsense Fat Melting Secrets has no more editorial control over such third-part Content or websites that we link to than does a public library or newsstand. Any opinions, advice, statements, services, offers, or other information that constitutes part of Content expressed or made available by third parties and not by The No Nonsense Fat Melting Secrets are those of the respective authors or distributors and not of The No Nonsense Fat Melting Secrets . Neither The No Nonsense Fat Melting Secrets nor any third party, including any Provider, or any User of the Website, guarantees the accuracy, completeness, or usefulness of any Content, nor its merchantability or fitness for any particular purpose. In many instances, the Content available through the Website represents the opinions and judgments of the respective Provider or User not under contract with The No Nonsense Fat Melting Secrets . The No Nonsense Fat Melting Secrets neither endorses nor is responsible for the accuracy or reliability of any opinion, advice, or statement made on 3rd party Websites we may link to. Under no circumstances shall The No Nonsense Fat Melting Secrets be liable for any loss, damage or harm caused by a User's reliance on information obtained through the Website. It is the responsibility of a User to evaluate the information, opinion, advice or other Content available through the Website. The Website may reference or link to third-party sites throughout the World Wide Web. The No Nonsense Fat Melting Secrets has no control over these third-party sites or the content within them. The No Nonsense Fat Melting Secrets cannot and does not guarantee, represent or warrant that the content contained in these third-party sites is accurate, legal, or inoffensive. The No Nonsense Fat Melting Secrets does not endorse the content of any third-party site, nor do we warrant that they will not contain viruses or otherwise impact your computer. The No Nonsense Fat Melting Secrets does not assume any responsibility or liability for the actions, product, services, and content of all these and any other third parties. If you choose to click thru to or use a third-party website, you should carefully review such third party's privacy statement and other terms and conditions of use. By using the Website to click on any link to another third-party site, you agree and understand that you may not make any claim against The No Nonsense Fat Melting Secrets for any damages or losses, whatsoever, resulting from your use of the Website to obtain information. Copyright © The No Nonsense Fat Melting Secrets 2014. All rights reserved. All materials and contents contained in the Website (including but not limited to the text, graphics, logos, button icons, images, audio clips, digital downloads, data compilations and software), and the Website itself, are copyrighted materials belonging exclusively to The No Nonsense Fat Melting Secrets or its content suppliers and are protected by United States and international copyright law. The No Nonsense Fat Melting Secrets enforces its copyright interests to the fullest extent permitted under the law, and shall seek civil and criminal remedies where appropriate, including the remedies provided for under sections 501 et seq. of Title 17 of the U.S. Code. All rights are reserved. The No Nonsense Fat Melting Secrets , and the related logos and other marks indicated on our Website are the exclusive property and trademarks of The No Nonsense Fat Melting Secrets reserves all rights, including all rights applicable under the U.S. and international trademark laws, including, without limitation Section 1125 of Title 15 of the U.S. Code (Lanham Act Sec. 43). All other trademarks not owned by The No Nonsense Fat Melting Secrets that appear on this Website are the property of their respective owners, who may or may not be affiliated with, connected to, or sponsored by The No Nonsense Fat Melting Secrets. You agree to defend, indemnify, and hold The No Nonsense Fat Melting Secrets and Providers harmless from and against any claims, actions or demands, liabilities and settlements including without limitation, reasonable legal and accounting fees, resulting from, or alleged to result from, your violation of these Terms and Conditions. The Website is created and controlled by The No Nonsense Fat Melting Secrets in the country of Costa Rica. As such, the laws of Costa Rica will govern these disclaimers, terms and conditions, without giving effect to any principles of conflicts of laws. The No Nonsense Fat Melting Secrets reserves the right to make changes to its Website and these disclaimers, terms and conditions at any time. User hereby irrevocably and unconditionally consents to submit to the jurisdiction of Costa Rica for any litigation arising out of or relating to use of or purchase made through the Website (and agrees not to commence any litigation relating thereto except in such courts), waives any objection to the laying of venue of any such litigation in the Costa Rica courts and agrees not to plead or claim in any Costa Rica court that such litigation brought therein has been brought in an inconvenient forum. In any action against us arising from the use of this Website, the prevailing party shall be entitled to recover all legal expenses incurred in connection with the action, including but not limited to its costs, both taxable and non-taxable, and reasonable attorney's fees. The No Nonsense Fat Melting Secrets reserves the right to make changes to the Website, these policies, and these Terms and Conditions at any time, effective immediately upon the posting on this Website. Please check these Terms and Conditions periodically. In addition, these Terms & Conditions may be modified only by our posting of changes to these Terms & Conditions on this Website. Each time you access this Website, you will be deemed to have accepted any such changes. If any of these terms and conditions shall be deemed invalid, void, or for any reason unenforceable, that term or condition shall be deemed severable and shall not affect the validity and enforceability of any remaining terms and conditions. These Terms & Conditions are the entire agreement between you and us relating to the subject matter herein. We may assign our rights and obligations under these Terms & Conditions. These Terms & Conditions will inure to the benefit of our successors, assigns, and licensees. The failure of either party to insist upon or enforce the strict performance of the other party with respect to any provision of these Terms & Conditions, or to exercise any right under the Terms & Conditions, will not be construed as a waiver or relinquishment to any extent of such party's right to assert or rely upon any such provision or right in that or any other instance; rather, the same will be and remain in full force and effect. The No Nonsense Fat Melting Secrets does, however, welcome your feedback regarding many areas of The No Nonsense Fat Melting Secrets's existing business. If you want to send us your feedback, and we hope you do, we simply request that you fill out the form on the contact us page. Please provide only specific feedback on The No Nonsense Fat Melting Secrets's existing products or marketing strategies; do not include any ideas that The No Nonsense Fat Melting Secrets's policy will not permit it to accept or consider. It's just one more way that The No Nonsense Fat Melting Secrets can learn how to best satisfy your needs. Any feedback you provide at this site shall be deemed to be non-confidential. The No Nonsense Fat Melting Secrets shall be free to use such information on an unrestricted basis.